Apologies for the long delay between posts, but things have been somewhat busy the past week. In my last post on the World Open, I summarized the first 5 rounds in Philly. After that relatively leisurely one-game-a-day pace, the last four rounds were a grueling stretch run with 2 games a day on each weekend day. In round 6, I had the black pieces against the Canadian FM, Michael Dougherty. I had played him once before, back in the 2001 Chicago Open, where I beat him as white in a Sicilian Rossolimo. Maybe it was the relatively early start to the round, but I wasn’t fully focused at the start of the game. 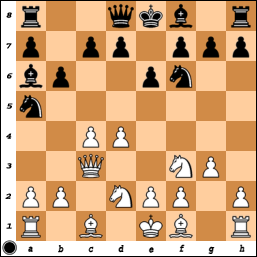 In the following position, I played 9…Qe7? 10.cxd5 exd5?, but I was rudely awakened by 11.e4!. The problem is simple – with Black’s king and queen lined up on the e-file, White is either going to force Black to take twice on e4, or will pry open the e-file by pushing the pawn on to e5 himself, when Black has no choice but to remove it. Luckily my position wasn’t just lost like that (although 9…Qe7 was a pretty bad move; the simple 9…0-0 was better, when Black has a comfortable position), and I managed to regroup in time. I played a serious of only moves to escape the troubles on the e-file after which my position was ok, but nothing special. However, when he decided to launch an attack that had no real basis in the position, I managed to put him away pretty quickly. Both GM Jesse Kraai and GM Josh Friedel weren’t very optimistic about my chances at this point, but it seems that White is just winning! Black’s problem is that he can’t get all of his pieces trained at White’s king as he could when the king was on g1. Amanov tried 22…Bg2+ 23.Ke1 Bh3 (23…Qb4+ is stopped by 24.Qd2, while 23…Bxf4 falls to 24.Qc4 Qe5+ 25.Ne2, when too many of Black’s pieces are hanging), but after 24.Qe3, he didn’t have anything productive to do. The game ended a few moves later. Hungaski, having reached the time control, spent a few minutes and played 41.Kg3?. This allowed me to play 41…Bxf3! 42.Kxf3 a5! 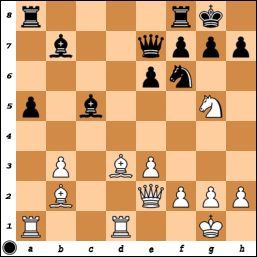 43.h4 a4 44.h5+ Kh7 45.Rb4 Ra1, when White can’t avoid the exchange of queenside pawns following 45…a3. The resulting 3 vs 2 R + P endgame is a simple draw for Black. Maybe the endgame is objectively drawn anyways, but to try and win it, White should have played either 41.Nd4 or 41.Nh4+, with some small advantage. Hungaski tried to squeeze the 3 vs 2 endgame, but to no avail and the game ended in a draw after 6 hours of play. Sadly, thanks to this marathon game, I missed the entire Federer-Roddick Wimbledon final! 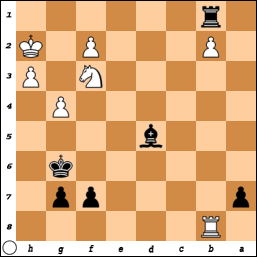 I couldn’t find anything particularly great, though, as Black has some simple ideas to try and improve his position (e.g. 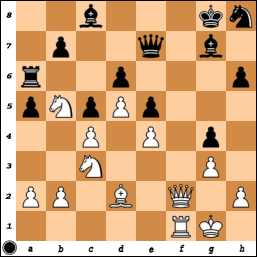 …Nf7-g5, …Bd7, …Ra8) while White doesn’t have such obvious building moves. I decided to play 27.b3, setting a small trap. The move b2-b3 helps fix the a5-pawn so it isn’t totally useless if Black sees the idea. Lee played 27…Nf7?, when I uncorked 28.Qxf7+!! Qxf7 29.Rxf7 Kxf7 30.Nc7. The point is that the rook is essentially trapped on a6! It can’t go back to a8, and if it retreats to a7, then 31.Nc3-b5 wins it, while if 30…Rb6, then 31.Na4 traps it. On 30…b6, White can either play 31.Na4 or 31.Nxa6, in both cases with excellent winning chances. Thus, Black has to give up the rook on a6, letting his a-pawns get doubled and leaving the a5-pawn without any support. The resulting endgame is winning for White, but I got a little nonchalant and didn’t sense that he could try and set up a fortress at one point. He, however, did not miss that chance and after that, I could only shuffle around and hope he blundered. When it was clear that he wasn’t going to do so, I offered a draw that was immediately accepted. Now I’m in Sao Paulo, Brazil, for the Pan-American Continental Championship that begins tomorrow. It’s a pretty strong field, where I’m seeded around #35 in the 11-round event. The website is at: http://www.continental2009.com. The top 6 finishers at this tournament qualify for the World Cup in November! There are about 30 GMs signed up for the event, so it should be a tough event. In the recently completed World Open in Philadelphia, I started out in the 7-day schedule. This gave me one travel day to get to Philly from Montreal, before starting the event with 1 game a day for 5 days. White has some small initiative thanks to the fact his minor pieces are more menacing than their black counterparts. After a long think, Potkin decided to play 18…g6. This allows a small tactic starting with 19.Bxf6. Do you see it? The game continued 19.Bxf6 Qxf6 20.Nxh7 Kxh7 21.Qh5+ Kg7 22.Qxc5, leaving White with an extra pawn. 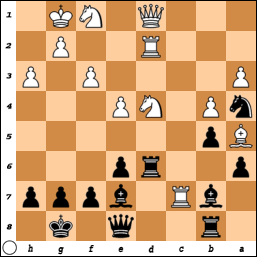 The only problem for me was that Black had more than enough compensation after 22…Rfc8 23.Qb5 Bc6 24.Qb6 Bd5. The White queen is oddly placed on b6, the b3-pawn is weak, and White has some back-rank issues. The game soon ended in a draw. While I was wondering what just happened, GM Evgeny Bareev (Kramnik’s former second) leaned over so far that I had to scoot back in my chair to give him room to see the position. Like Bareev, my first reaction was shock – how could he take my c4-pawn with such impunity when I have it guarded twice? However, I then realized that after 8.Nxc4 Nd5 9.Qc2 Nb4, White has trouble escaping the knight’s attacks while staying in touch with the knight on c4. I rejected the early draw by repetition and went for it with 10.Qc3 Nd5 11.Qc2 Nb4 12.Qa4. After 12…Nxc4 13.a3 b5 (the only move) 14.Qb3 Na5 (again, the only move) 15.Qd1 Nbc6 16.e4, White is actually better. Unfortunately for Josh, the computer misevaluates the capture on c4 because it thinks Black is just better here at first. However, after a few minutes of thought, it realizes White is better. Fortunately for Josh, though, he defended quite well and after 4 hours and a crazy middlegame, the game ended in a draw. If White takes the knight, he loses his great bishop on d6, so Ray played 33.Bd3. This is where my time trouble problem reared its ugly head. With less than half a minute to reach move 40, and no increment to rely on (I repeatedly looked at the clock after I moved, hoping in vain that it would add 30 seconds to my time! ), I lashed out with 33…d4 34.cxd4 Nd5 35.Qf3 Qxd4+ 36.Kg3. With the dust settling, and the clock ticking down, I realized I didn’t have any good continuation! 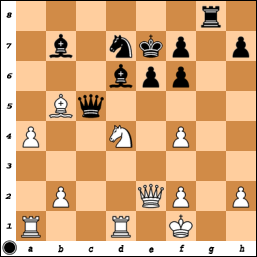 Instead, I’ve just opened the c-file for White’s benefit, as now Rhc1 follows with ideas of Rxc6+ or Bxa6. 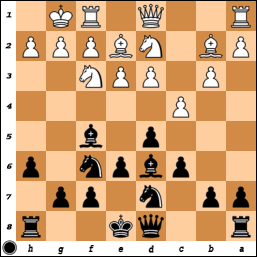 Black would have been doing just fine with 33…Ne4+ 34.Bxe4 dxe4. The c-file remains closed and White doesn’t have the two bishops anymore. Meanwhile, the bishop on d6 can be undermined with …f6. After my mistake in the game, though, Ray managed to put me away with both of us getting into a big time scramble. With a couple accurate moves, he can put the game out of reach. One winning line, for example, is: 54.Rd7 Qc6 55.Rc7! Qxe6 56.b7! 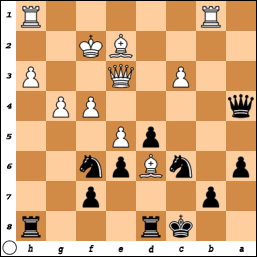 – not 56.Qxc3 Qxb6+, when Black is fine. My opponent also had some doubts about the rook endgame after something like 56.Rxc3 Rb8 57.Rc7 Qxb6 58.Rxg7+ Kh8 59.Qxb6 Rxb6 60.Rf7, but White should win this one. Maybe if everything was quiet in the tournament hall, Bartell would have found the correct continuation. 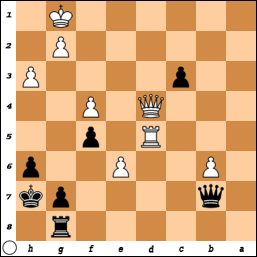 As it was, with Williams’ long outburst, his clock wound down and he played 54.Rxf5?. After 54…c2, he found the only way to hold his position together with 55.Rc5 Qxb6 56.Kh2!, and the game ended in a draw about 15 moves later. After this game, I had 1.5/4 and the 7-day schedule was going to merge with the 4- and 5-day schedules on Friday night. My 5th round game, as white against Seth Homa, was not particularly interesting – it ended in a draw after some minor adventures. On this day, though, I met my brother’s wife’s brother (Lee Huang) and his two kids in the Reading Terminal Market in Philadelphia. I played a good amount of Monopoly as a young kid, but I finally got to take a ride on the Reading! The farmer’s market they had going was pretty good too. I’m back in the Bay Area after my two tournament trip to Montreal and Philadelphia. I wasn’t able to get online much in Philadelphia, especially once the schedule shifted to include two games a day. In the end, I finished with 5 points from 9 games – not a particularly inspiring performance – but I did play a lot of good players and some interesting games. In the first round of the 7-day schedule, I played up against GM Vladimir Potkin. The last time I played up in the first round of a swiss was in 2002 in China when I was much lower rated! Actually, I played up in the first 3 rounds, which was quite a surprise. The rest of my field was over 2400 FIDE on average, so it was a pretty strong tournament. I squandered a couple opportunities in rounds 5 and 9 that would probably have improved my final position. I did get quite lucky, though, in round 4 against FM Thomas Bartell (I should have taken the draw he offered when I was worse!). Thanks to that save, I only lost one game, to IM Ray Robson (the most recent Samford Fellow). If this were Shakespeare, the moment would have been rife with imagery and symbolism, but for now, I’ll just say that on the first day of his Fellowship, he beat the 2008 recipient. Then on the following day, he beat the 2007 recipient, GM Josh Friedel! This is no knock against Nakamura, who played quite well and took advantage of both his strengths and the scheduling quirks. However, it is kind of silly in my view to have a tournament that gives you the opportunity to win like this. The 4-day Open Section schedule was a farce, with only 3 players showing up, so everybody got a full-point bye. The 3-day schedule Open Section only had 2 GMs, and with 5 rounds amongst themselves at G/45, it was almost like a different tournament than the more popular 5- and 7-day schedules. The 7-day and 5-day schedules, by comparison to the 3-day, were much stronger – the 7-day featured a GM-GM pairing in round 1! Najer played 8 GMs, and as some consolation for a more brutal schedule, he won the tournament title on tie-break as Nakamura wasn’t there to contest the blitz playoff. Of course, Goichberg runs his tournaments in the purest capitalist sense, so he probably won’t change his ways. Multiple schedules allow for more re-entries and a few extra bucks in his pocket. For a few players, it also helps avoid taking time off from work and cutting down on hotel costs. But when there are such prizes at stake, it difficult to imagine another sporting event where this is possible – there are amazingly different schedules with different fields and time controls and a co-champion doesn’t even show up for the last two rounds and gets something more than a zero-point bye for those rounds. Foxwoods is a rather strong open tournament, but the Open Section there has only one schedule. I would think the World Open should adopt the same format. As a side note, what happened with GM Leonid Yudasin in round 8? The wallchart at the time said he had withdrawn, but when I walked around, there he was playing Robert Lau around board 80 in round 8! Yes, the same Robert Lau who was not playing in the Open Section until that round! Yudasin won that game, and then won a marathon game against GM Kacheishvili in the last round to claim $2160 in prize money. How is this possible? He received a ridiculous pairing, much easier than his fellow 4.5 pointers in round 8, and it counted? I’m not sure how the pairings would have shaken out had Yudasin been paired correctly, but GM Josh Friedel, who is right around Yudasin’s rating, played GM Gata Kamsky in that round. I wonder which is an easier pairing: a 2200 with black (who isn’t even in the section), or Kamsky with black? I’m not sure if there was any debate at the tournament about this, but it seems rather odd to me. Here’s a link to the wallchart, and I’d appreciate if someone could explain this one to me.